Israeli soldiers attacked, Friday, the Great Return March processions on Palestinian lands near the perimeter fence in the besieged Gaza Strip, and shot fourteen Palestinians, including one child. Medical sources said the soldiers stationed in their fortified posts across the fence, fired dozens of live rounds and high-velocity gas bombs at the protesters. It added that the soldiers shot three Palestinians with live fire, and causing many to suffer the effects of teargas inhalation, east Rafah, in the southern part of the Gaza Strip. The soldiers also shot two Palestinians east of Gaza city, and east of Jabalia, in the northern part of the coastal region. The Health Ministry in Gaza has reported that the soldiers have injured at least 14 Palestinians, and caused dozens to suffer the effects of teargas inhalation. 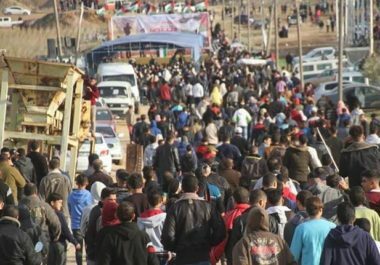 The processions are still ongoing, while hundreds of Palestinians continue to gather in and near the Great Return March encampments across the eastern parts of the Gaza Strip. This week’s processions are dubbed as “Resistance Unites Us,” and marks the 35th consecutive week of ongoing processions. 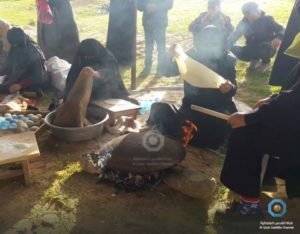 Dozens of women also gathered in tents, and started baking bread and cookies on wood fire, as part of ongoing activities of the Great Return March processions.